Where shall the root filling end? On average, the minor foramen is 0.5 mm coronal to the major foramen, which is 0.5 mm from the radiographic apex (Kuttler 1955). Gutta percha cannot seal beyond the narrowest diameter of the root shape, or into a divergent apex(Weine 1975). Gutta percha beyond this point certainly won’t help, and although tolerated by tissues (Seltzer 1975), extruded filling material is associated with delay healing (Molven 2002). Cone Beam Computed Tomography can help to determine where the actual minor constriction is in relation to the radiographic apex. This way, treatment can be more precise than “filling” every case to the radiographic apex to achieve “the look”, and deleterious effects can be avoided. Note how in the case above, the pre-op PA does not indicate where the minor constriction is. 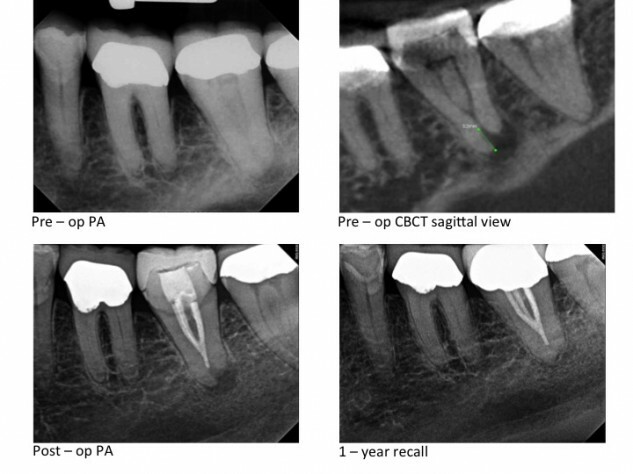 The CBCT view shows that the minor constriction is 3.2 mm coronal to the radiographic apex. The case was filled to the minor constriction, and excellent healing is evident at the 1-year recall.